You guys! I’m sitting here running my fingers through my hair thinking, “All this softness for $1.99. 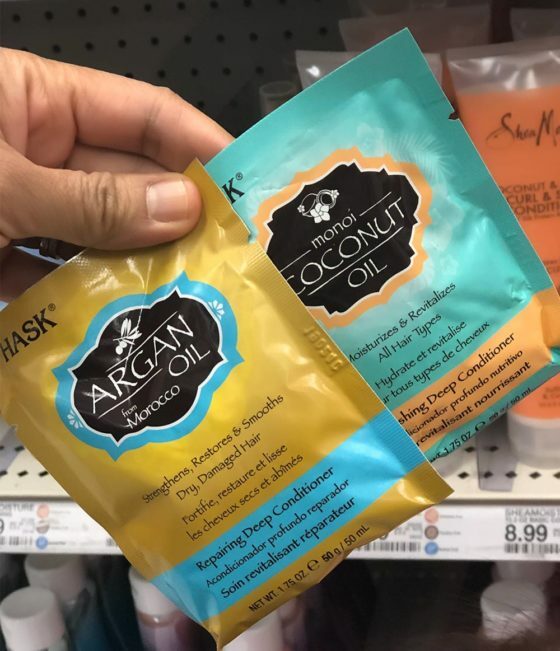 ONE HUNDRED AND NINETY NINE PENNIES,” because last night I did a Hask hair mask. They have a few different versions, and I used the Coconut Oil one. Now my hair feels silky soft, but not in the way that feels like your hair is coated in sedimentary layers of silicone… The tangles and knots are gone, and the obnoxious white ramen noodle flyaways in my hairline — which normally stick up at every unfortunate angle you can imagine — are relatively tame and smooth and lying in one direction (SAY WHAT"!). If your hair is feeling dry and/or in need of some serious TLC, all you need is 10 minutes and a generous coating of this thick conditioner.